Co-sponsored by Georgetown University’s chapter of the Financial Management Association, the Women on Wall Street event provides students with the opportunity to hear the current voice of women on Wall Street. Representing a variety of ages and experience, representatives from various companies share their stories of triumphs and tribulations as they negotiated their careers as women in business. 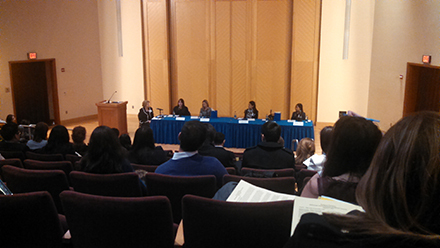 Georgetown’s chapter of the Financial Management Association, in partnership with Georgetown University Women’s Leadership Initiative, hosted the Women on Wall Street panel, on January 8. In her first year on Wall Street, Janine Shelffo (B ’89) found herself struggling with the rising stress level of the analyst lifestyle, so she spent her Sunday mornings in a self-made sanctuary – that of an art studio. Now head of the technology, media, and telecom investment banking effort at UBS, Shelffo uses the story to illustrate the importance of carving out personal time amid an often hectic and demanding career. “You have to do what you love,” said Shelffo, one of 10 female executives in the financial industry at Georgetown University’s McDonough School of Business sixth annual Women on Wall Street event. The event, held on Jan. 8 at Georgetown McDonough, was co-sponsored by the Georgetown University Women’s Leadership Initiative and the Financial Management Association. The women, representing 10 top financial companies, shared their advice on landing jobs and internships and how to stand out in a competitive field. The executives, speaking to some 300 male and female students, agreed that Wall Street provides a level playing field for women. Most companies offer mentorship programs, networking groups, and events specifically for women in the field. When moderator Lynn Doran, finance professor at Georgetown McDonough, asked the panelists which skills women needed to succeed on Wall Street, the response was unanimous: the same skills anyone would need. The message that work/life balance is attainable resonated with Kaitlyn Cheney (B ’16), a finance and management major. “It’s nice to see women of this level and the success they have achieved,” she said.